Why is it that recent college graduates are having such a difficult time securing a decent job after they graduate? There was an article in Time, which I recommend you read “The Real Reason New College Grads Can’t Get Hired.” There are some interesting theories based on several different surveys. They treat the job search as “transaction processing” rather than a strategic marketing project. They have a short term mindset. They don’t understand the self-promotion and marketing business. Their self-awareness tanks are nearly empty. They don’t understand the employer perspective. In this Aol article, findings from a recent CareerBuilder study report that 16% of employers believe soft skills are more important than technical skills. How would you rate your mastery and demonstration of these soft skills (listed in order of importance by employers)? Are you sure about your answers? Because, the following Chegg study found otherwise. Here is the full report. You don’t know what you don’t know! And there have been many earlier studies that prove this as well. Last year, the Career Advisory Board, affiliated with Devry University, released a skills gap study. 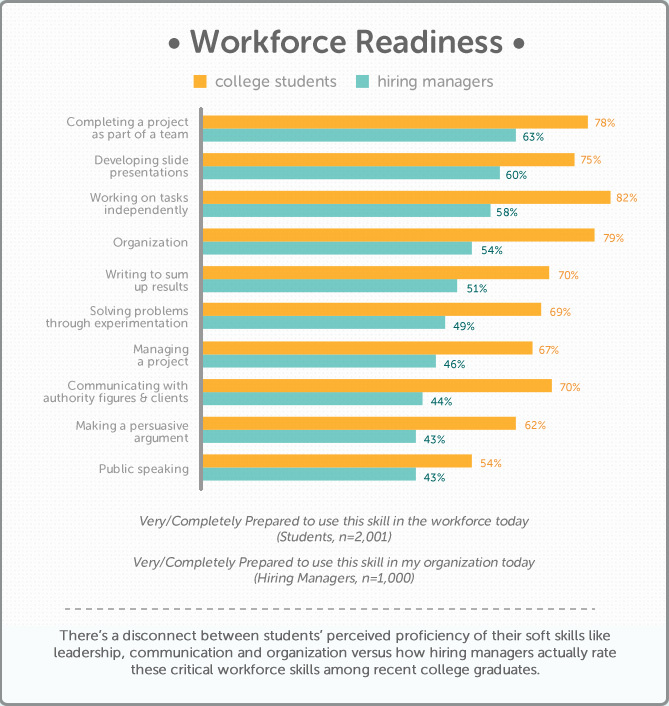 Employers ranked the skills they thought were most important for entry level workers and new college graduated rated what they thought were most important. This graph says a lot. Job seekers were asked to describe themselves in terms of the same skills/traits the managers evaluated, as a basis for comparison. How Much Do You Know About Job Search? Will Your Job Meet Your Expectations? According to Accenture’s study, probably not. The data is grim, but real.